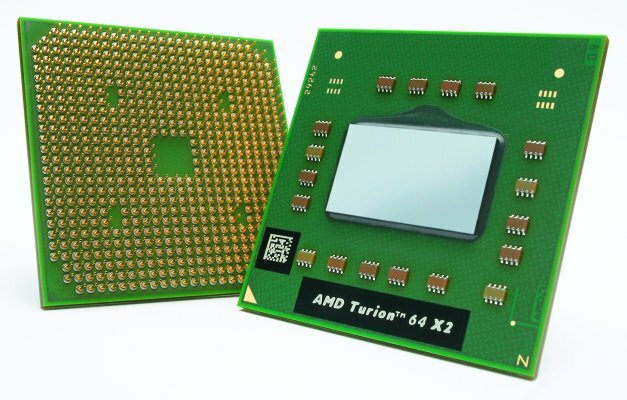 The AMD Turion 64 X2 was the first dual core processor by AMD and is the direct competitor of Intel's Core Duo. One key feature is that it already supports 64-bit computing, which Intel supports only since the introduction of its Core 2 Duo. Furthermore, it comes with an integrated DDR2 memory controller (2-way DDR2). However, due to the smaller L2 cache, the performance of the first Turion 64 X2 models was a few percents lower than of equally clocked Core Duos. Successors of the Turion 64 X2 are the Turion 64 X2 Ultra code-named Puma. These have the same core, but a K10 based memory controller. The two cores of the Turion 64 X2 are based on the K8L architecture. So, these are very similar to the Turion 64 core and the Athlon 64 X2 core for desktops. Each of the two cores has 128 KB L1 cache and depending on the model 256 respectively 512 KB L2 cache. Due to the small L2 cache the Turion X2 is slower than a Core Duo or a Core 2 Due by Intel. At the beginning the Turion was produced in 90nm, later in 65nm technology. It supports the following instruction extensions: MMX, Extended 3DNow!, SSE, SSE2, SSE3, AMD64, PowerNow!, NX-Bit, AMD-V. The AMD Turion 64 X2 processor features the AMD PowerNow! technology, which is comparable to the Speedstep technology by Intel. It allows the processor to automatically reduce the clock-frequency (to 800/1000 MHz) and the voltage in order to save energy. However, it cannot reduce the voltage as far as the Core (2) Duo can, because the memory controller has to be always energised. The successor model, the Turion 64 X2 Ultra code-named 'Griffin', where both parts are separately energised, and later developments support this. According to AMD the Turion should need less energy in any sleep state than the Core Duo by Intel. Due to the smaller L2 cache, the Turion 64 X2 is slower than its direct competitor, the Intel Core (2) Duo. However, this is not the only reason for being not that speedy. Even equally clocked Pentium Dual-Core processors with only 1024 KB L2 cache are faster than the Turion. Nevertheless, the performance of the Turion suffices all non-demanding tasks.